I’ve really enjoyed so many of the books I’ve read in the past few years, but few authors stand out for absolute originality as much Lauren Beukes. In Moxyland, Beukes gives the reader a very believable future where technology is so integrated that it’s impossible to imagine someone without their cellphone or their nanotech drug of choice. Corporations continue to grow and look for new, improved ways of hanging on to clients and have more pull and power than does the political system. Here, individuals become corporations themselves, and social media is more ‘real’ (certainly more safe) than the outside world. Kendra is an art school drop-out and sellout. She’s become a walking billboard for a soft drink company – their logo shines through her skin and she’s constantly craving the drink. Toby is a video blogger who likes to think of himself as little more of a rebel than he probably is. Lerator is an AIDS-baby who works for a major corporation as one of their best programmers, but she gets a high from hacking. And there is Tendeka, the rebel who pulls together the others and tries to cut short the strings of the corporations to the everyday people. The story is told from all four points of view, alternating by chapter. Of the Lauren Beukes books that I’ve read, this has so far been my least favorite. There are many similarities with Zoo Story – mostly with the setting and the technology running amok ideas – perhaps this is becoming her signature, but because of the alternating points of view, the story becomes much more fractured. I never quite bond with any of the characters because just when I felt I was about to understand them and see their side of things, I’d be switched to someone else’s view. Because Beukes is so original, I spent a fair amount of time just grasping on to new concepts and trying to understand the world and the technology. Add this to the jumping points of view and I really struggled to get to know the people who mattered in the story. Because for all her concepts, Beukes still writes about people and human behavior. And without my connection to them, the story didn’t have the impact that it should. I want to read this again. Knowing now how the story is presented, and now more familiar with the setting, I think I’d be ready to pick up more on the characters’ story. But for a one-time reading, this just doesn’t quite work. Looking for a good book? 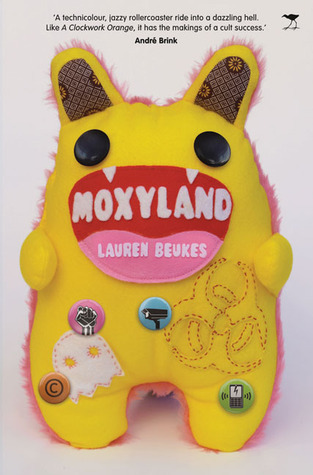 Lauren Beukes reaches out into some new territory once again, with Moxyland, but the fractured story-telling style keeps the reader from becoming fully vested.